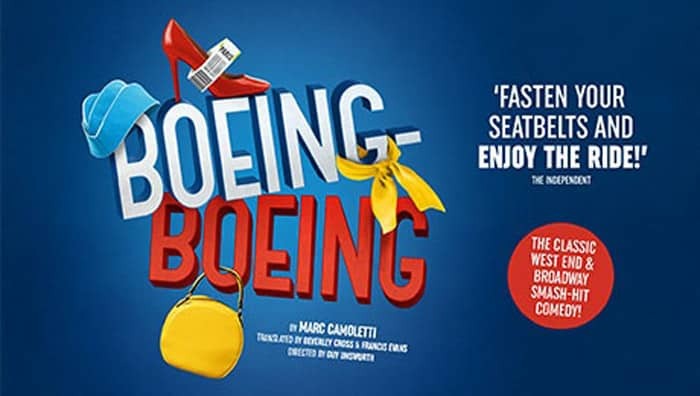 Marc Camoletti’s uproarious comedy Boeing Boeing is back for a limited tour in a new production by Guy Unsworth. But it’s 1965, and Boeing have launched a new, faster aeroplane that’s going to create some serious turbulence, with Bernard’s three fiancés landing unexpectedly and simultaneously! As the hilarity really starts to take off, can Bernard survive while his long-suffering maid struggles to keep up with the changes and his befuddled friend Robert can’t even remember which stories go with which airline….? A multi award-winning West End and Broadway comedy classic, don’t miss this brand new high-octane production from Guy Unsworth (Some Mothers Do ‘Ave ‘Em)!